What do you pack when planning a trip to Wonderland? It's a difficult decision, mainly because you never know what kind of adventure awaits upon your arrival. An outfit elegant enough for attending a Mad Hatter's tea party is probably not going to be durable enough should you get pulled into a hunt for a ferocious jabberwock, and neither one is going to be of much use if you drink the wrong potion and suddenly grow to 20 feet tall. 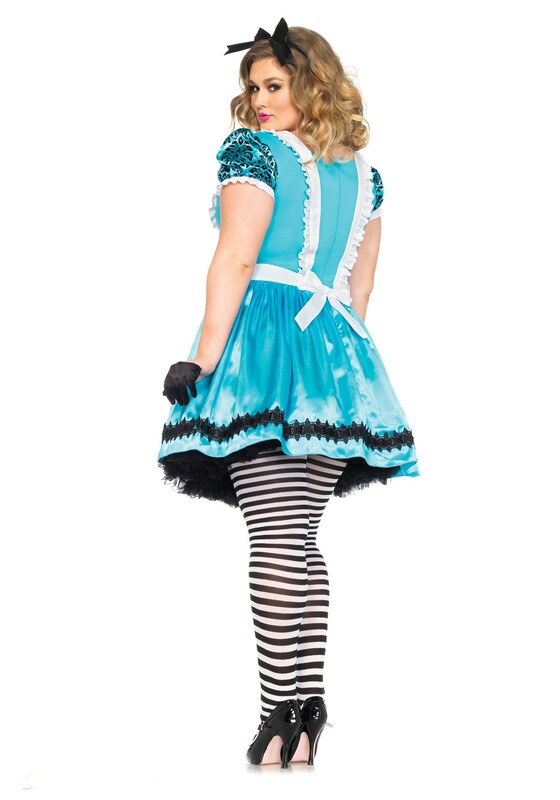 Even getting into Wonderland requires clothing flexible enough for crawling down a rabbit hole or climbing into a magic mirror. Fortunately, one of the side benefits of planning a weekend trip to a land of magical and madcap whimsy is that the usual rules of fashion don't apply. It's the rare instance where you can feel comfortable wearing the same outfit to consort with a short-tempered queen, watch a lion fight a unicorn, or attend an unbirthday party for a condescending egg-man. Say what you will about Wonderland's accommodations, but they know how to cut down on luggage costs. The official Wonderland Tourism Board guidelines suggest a fashionable yet functional ensemble like this polyester back-zip dress with puffed sleeves, a ribbon-laced bodice, and ruffle-edged apron. Top it off with a ribbon bow for your hair and you’re ready for two-man poetry recitals, life-size chess matches, unexpected coronations and all of the other weird and wonderful things one sometimes encounters when one walks through a mirror.